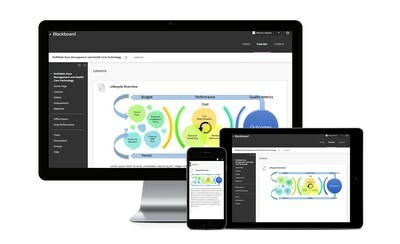 WASHINGTON, May 9, 2017 /PRNewswire/ -- Blackboard Inc., a leading education technology company for teaching, learning and student engagement, today announced new updates to Blackboard Learn, its flagship Learning Management System (LMS). 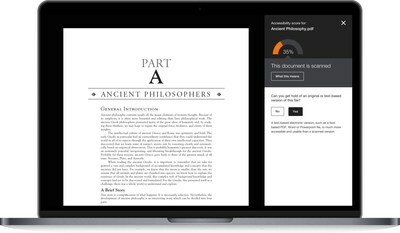 These updates bring new features and usability enhancements to both the Original experience (also known as Blackboard Learn 9.1) and the Ultra experience. "The market-leading Blackboard Learn continues to evolve to meet the varied needs of students and instructors globally," said Phillip Miller, Vice President of Teaching and Learning at Blackboard. "We continue to invest in the underlying technology and foundation of the Original experience to ensure that it will successfully support millions of educators and learners for many years to come, while simultaneously bringing new features and functionality to both the Original and Ultra experiences – ultimately giving clients more choice." Blackboard Ally Integration for Content Accessibility: The new solution automatically runs course materials through an accessibility checklist that looks for common accessibility issues and generates a range of more accessible alternatives for the instructor's original content including Semantic HTML, audio, ePub, and electronic Braille. Theme Improvements for Mobile Optimization: Blackboard is continuing its commitment to enhance the mobile experience for students and educators by improving web responsiveness for mobile devices. Additional Drag-and-Drop Locations: Blackboard continues to improve user efficiency by adding the ability to drag-and-drop files and folders for upload in more locations. Outcomes Assessment (sampling by demographics): Assessment managers can now sample student assignments by demographic information. For example, they can sample graduating seniors in a specific program for a secondary program evaluation process. LTI Enhancements: LTI course links created by partners' and institutionally created solutions through Building Block APIs can now leverage LTI Outcomes 1.0 for grade/score return. Additional REST APIs: New REST web services for SIS integration enable administrators to check on job status and retrieve error records, so they can set up processes for monitoring and record correction. Goal Alignment Capabilities: Instructors can gain deeper insight into student performance by aligning goals to objects, including test questions, rubrics, content, LTI links, discussions, and more. Localization for Global Markets: All the left-to-right languages supported in the Original experience are now supported in the Ultra experience as well. Administrators and users can select a locale that changes the user interface. Incorporating Client Feedback from Pilots: Enhancements and new capabilities in the areas of assessment, content creation, and discussions have been added based on client feedback from recent pilots.